The healthcare industry would crash without the direct patient care services that Certified Nursing Assistants provide. Dedicated and compassionate nursing assistants improve the lives of patients and their families daily. 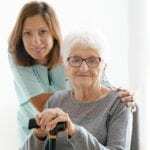 CNAs spend more time attending to patients and residents than doctors or nurses, sometimes spending up to eight to ten hours a day in the company of elderly or disabled residents. To be on the frontline of patient care, a prospective nurse assistant should have a genuine concern for others, effective communication skills, and emotional and physical strength to cope with the rigors of the job. The individual should also be dependable, trustworthy, and responsible. If you want to make a living caring for the sick or elderly in Daytona Beach, Florida, the State Board of Nursing requires that you complete at least 120 hours of didactic and clinical training before taking the nurse assistant competency exam for state certification. The nursing assistant program at Daytona College prepares students for entry-level employment under the supervision of a licensed nurse. The program offers 120 contact hours of instruction and clinical practice. Students spend 4 weeks in the classroom covering topics such as basic nursing skills, body mechanics, infection control, emergency procedures, restoration and rehabilitation, patient care skills, nutrition, and patients’ rights. Following the classroom training, students spend two weeks in a clinical setting where they provide direct care services to residents in an assisted living facility. Graduates of the Board of Nursing approved program must take the certification exam within 60 days of graduation. The cost of attendance is $610 plus $140 for a criminal background check. Caring for Others Academy is a state-approved testing center, so students can take the nurse assistant competency exam in a familiar facility. The goal of the training is to prepare students for success on the exam and the job. The course covers classroom and clinical instruction to give students the confidence to succeed on both the knowledge and skills components of the state certification exam. Course topics include anatomy, resident comfort, feeding and nutrition, restorative care, communication skills, medical terminology, basic nursing, personal care, death and dying. The Academy offers several schedules to accommodate students’ busy lifestyle. The four-day prep course includes instruction in the 22 hands-on skills. Tuition is $250. Daytona State College offers a Board-approved training program that equips students with the knowledge, abilities and skills to function as nurse assistants in a long term care setting. The 8-week program comprises of classroom and clinical training, which is provided in a long-term care facility. Currently, the program is evening only. Applicants for admission must have a photo ID to schedule a mandatory test at the school’s Assessment Center. The CNA packet, available on the school’s website, details the entire procedure for admissions, including a level II background check and drug screening. Successful candidates must print the CNA Lab Kit Order Form to acquire the kit for the first week of class. Applicants with a high school diploma, or satisfactory CPT, SAT, or ACT scores can skip the placement test. Tuition and textbooks cost $475.68. Additional costs include uniform, liability lab fee, graduation fee, DSC assessment fee, background check, NACEP exam fee, and a watch with a second hand. Prepare for the state certification exam through 160 hours of training at the Professional Development and Training Center. The school’s comprehensive nurse assistant training program trains students in all aspects of long-term patient care, including caring for persons with special needs, patient safety, patients’ rights and independence, nutrition, communication skills, infection control, medical terminology, anatomy, and basic nursing skills. After completing classroom training and active demonstrations in a simulated lab, students put their learning to work at a local skilled nursing facility where they participate in 40 hours of clinical practice. Applicants without a high school diploma must pass an admissions exam. Other requirements for entry include a criminal background check, immunization, and CPR. The fast-track CNA training program at Halifax Academy prepares students for success on the state exam. Experienced instructors cover the essential 22 skills and knowledge to pass the written and skills component of the state exam. Students who fail the state exam can retake the 4-day course for free. Applicants do not need a high school diploma to enroll in the training. The tuition of $375 includes a free stethoscope and use of the course textbooks. Convenient morning and evening classes are available to accommodate busy schedules. Upon graduation, students are prepared to take the state competency exam, which is available at Halifax facility. Halifax maintains a list of potential employers to assist graduates with job placement.